Terry Berlier is obsessed with treehouses. She is working on a site-specific outdoor sound sculpture for Montalvo’s summer theme Play. 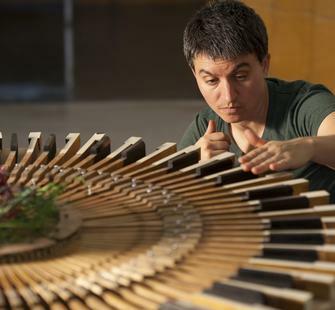 When she is not building a treehouse at home or at Montalvo she is teaching kinetic sculpture at Stanford University. She has exhibited both nationally and internationally including Norway, Spain and Hungary. She has received numerous grants including the Center for Cultural Innovation and Arts Council Silicon Valley Artist Fellowship. She has been awarded numerous residencies including Millay Colony for Artists, Lademoen Kunstnerveksteder Norway, Recology San Francisco and Visions from the New California Award at the Exploratorium Museum of Science, Art and Human Perception. Berlier grew up in Ohio where her family's playroom was in between her mother’s sewing corner and her fathers' tool room. The door between the two was always open and she did not distinguish between playing and making. She was fortunate enough to have two enthusiastic and dedicated public high school art teachers after recovering from catholic grade school. After receiving her BFA from Miami University in Oxford Ohio she worked at a skeleton factory in the cornfields of Iowa. She joined the Peace Corps who sent her to Jamaica where she co-organized the island’s first pit latrine-emptying project and tried to stop the sugar cane factory from polluting her village's fishing river. Briefly back in Ohio she worked many freelance jobs. Her favorite was as a studio assistant to artist Mark Fox doing complex Butoh inspired puppet theater where she learned to move very, very slowly. On September 11 (her first day in California) she woke up in her new studio at University of California Davis where she began the MFA program. She lived in a trailer park on the historic Lincoln highway where the Amtrak (15 feet away) shook her 15’ x 15’ cottage. After grad school she stuck around to make the film 'remain human' about that same trailer park. Three days before her MFA thesis show the cops found human remains in the dumpster 20 feet from her front door, hence the film's title. She moved closer to the Bay Area and was freeway faculty in almost all the art departments from Santa Cruz to Sonoma to Sacramento to San Francisco. She is currently based in Oakland California where she lives with her partner, stepdaughter and cat.